North Korea's young leader has riled the U.S. with recent nuclear tests, but Kim Jong Un doesn't really want war with the superpower, just a call from President Barack Obama to chat about their shared love of basketball, according to erstwhile diplomat Dennis Rodman, the ex-NBA star just back from an improbable visit to the reclusive communist country. "He asked me to give Obama something to say and do one thing. He wants Obama to do one thing, call him," said Rodman, who called the authoritarian leader an "awesome guy" during his trip. The State Department criticized North Korea last week for "wining and dining" Rodman while its own people go hungry. 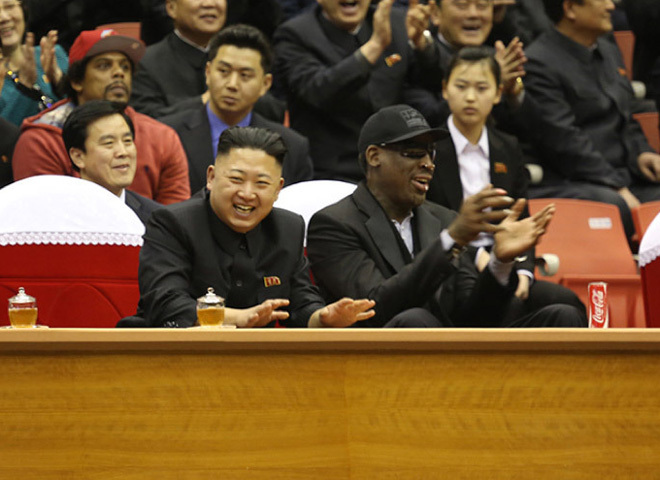 Rodman tells N. Korean leader Kim Jong Un: "You have a friend for life"
Basketball is popular in North Korea, and Thursday's exhibition game with two Americans playing on each time alongside North Koreans ended in a 110-110 tie. Following the game Kim threw an "epic feast" for the group, plying them with food and drinks and making round after round of toasts.